It’s the name of the lake at the heart of the Disney World resort area. 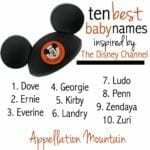 Disney Baby Names Week starts with Bay as our Baby Name of the Day. The Old French bayer meant “to gape or yawn.” It’s the source of our term bay window. It’s a French word to describe the howl of a dog, along the lines of bark or bow-wow. When we hold something – usually a negative outcome – at bay, it’s a reference to hunting dogs. The Latin baia gives us the French baie, a word meaning an inlet of the sea – and making Bay a nature name, too. In Anglo-French, bai was a chestnut-brown color, originally used to describe horses, from the Latin badius. The Latin baca – berry – became baie in French, and refers to the bayberry, as well as bay trees, the source of the leaf used as a spice. It could be a simplified form of Old English names like Beaga or Germanic names like Baio and Bayer. It could be short for surname name Bailey – as in a bailiff. It’s also found in Vietnamese and Chinese, with various meanings. 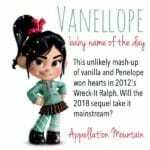 So what makes this a Disney baby name? It’s all thanks to a lake. Ages before Walt Disney ever dreamed up a single sketch, the lake was there in Florida. It’s said that Walt spotted Bay Lake from the air while scouting possible locations for his new theme park. The area around the lake became part of the Reedy Creek Improvement District, and the newly created municipality of Lake Buena Vista, in 1967. The biggest island within the lake had previously been used for hunting. Locals called it Raz Island, then Riles Island, but Disney first operated it as Treasure Island, and then Discovery Island – a wildlife park precursor to Animal Kingdom. Today it’s closed, though Disney fans remain fascinated by the history of the deserted attraction. Several of Disney’s more upscale resorts ring Bay Lake, which connects to the man-made Seven Seas Lagoon. They’re used for water sports, as well as resort transportation. While it’s easy to visit Epcot or the Magic Kingdom and not be aware of Bay Lake, if you stay within Disney World, odd s are that you’ve crossed Bay Lake, or maybe even stayed on its shores. You might think of conservative pundit Bay Buchanan – born Angela. She served as US Treasurer under president Ronald Reagan. The name has a long history of sparing use. In 2011, there were ten newborn girls named Bay, along with seven boys. Then came 2012, with 44 newborn girls given the name. By 2014, it was 74 girls. That’s because of Bay Madeline Kennish, a fictional character from ABC Family’s Switched at Birth. The show deb uted in June 2011, and is currently in its fourth season. The story follows two girls who were accidentally switched at birth in the hospital, and their families, as they deal with their discovery. Of course, Disney owns ABC Family – so that makes Bay a double Disney possibility. Switched at Birth has boosted this name for a girl, but Bay works for both genders. It sounds like Jay as well as Kay, and nature names like River and Ocean tend to work well for boys and girls. If you’re after Disney baby names, Bay is subtle – a nod to Walt Disney World that’s less obvious than Cinderella or Mickey. What do you think of Bay? Do you like it better for a boy or a girl? My father and my niece both have the name Bay. I love it! I love this for a middle, boy or girl, which is a rarity since I usually hate unisex names. Somehow some nature names seem universal, and I can’t pass up a good 1-syllable word name. Swoon. I also like it better on boys. Love this name! It feels so deep for so few letters. I think it’s a stretch to call it a Disney name, but I like Bay, especially in the middle position. I know someone who used it on their daughter, in honor of the Chesapeake.